NGC 6744 is situated in the constellation of Pavo at a distance of about 25 million light-years. It was discovered in June 1826 by the British astronomer James Dunlop. At first glance, it resembles our Milky Way Galaxy albeit larger, measuring more than 200,000 light-years across compared to 100,000 light-year diameter for our Galaxy. NGC 6744 is similar to the Milky Way in more ways than one. Like our home Galaxy, it has a prominent central region packed with old yellow stars. Moving away from NGC 6744’s galactic core, we can see parts of the dusty spiral arms painted in shades of pink and blue. While the blue sites are full of young star clusters, the pink ones are regions of active star formation, indicating that the galaxy is still very lively. In 2005, a supernova — named SN 2005at — was discovered within NGC 6744, adding to the argument of this galaxy’s liveliness. SN 2005at is a type Ic supernova, formed when a massive star collapses in itself and loses its hydrogen envelope. 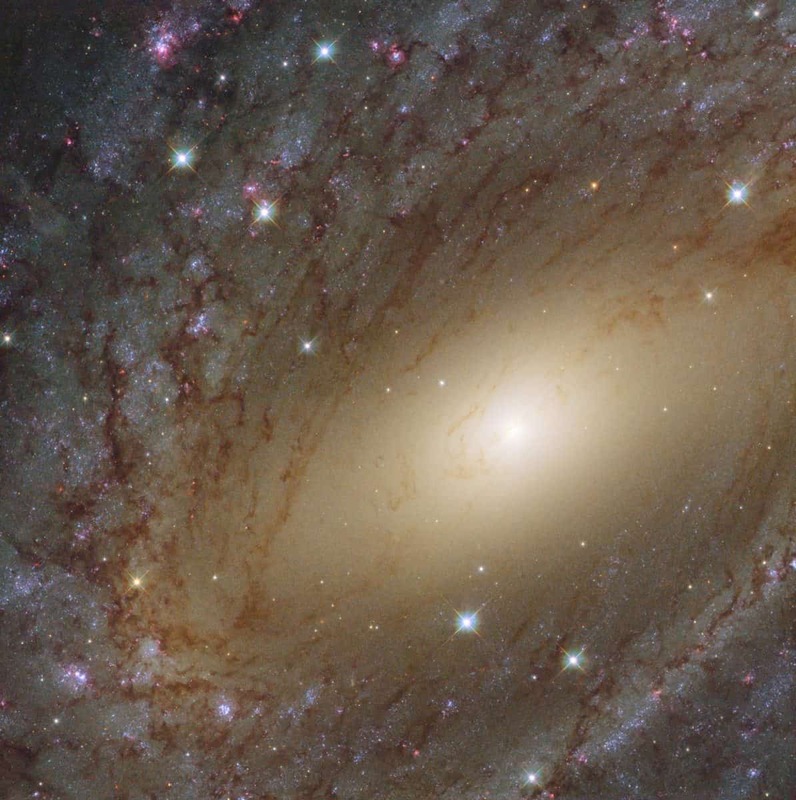 This image of NGC 6744 was taken by Hubble’s Wide Field Camera 3 (WFC3) as part of the Legacy ExtraGalactic UV Survey (LEGUS), the most comprehensive ultraviolet-light survey of nearby star-forming galaxies. This survey will help astronomers interpret views of galaxies in the distant Universe, where the ultraviolet glow from young stars is stretched to infrared wavelengths due to the expansion of space.